It’s Day 12 of our 21 Day Yoga Challenge. Try taking your yoga and meditation practice outside today. Have fun. Play in the grass. Listen to the sounds of nature (or the sounds of your neighbors 🙂 ). Relax into what’s agreeable as well as anything disagreeable. Above is a slide show of a class that I taught at National Harbor last Thursday. I’m teaching a FREE class at National Harbor tomorrow, Tuesday, August 13 as well. If you live close by, come and join me. It’s at the marina from 7-8 pm. Bring a mat and water. Hope to see you there! 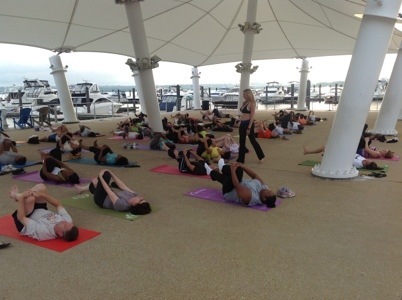 Click here for more information about yoga at National Harbor.